The red cabbage is a kind of cabbage, also known as purple cabbage after preparation. On cooking, red cabbage will normally turn blue. To retain the red colour it is necessary to add vinegar or acidic fruit to the pot. 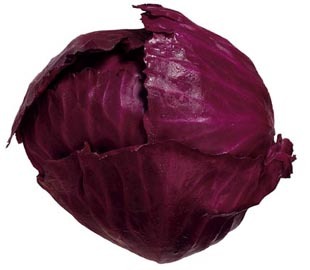 Cooked red cabbages have better nutritional value as a food than the cooked green varieties. Red cabbage has anti-inflammatory, anti-cancer and cholesterol reducing properties. Red cabbage contains almost twice the vitamin C as green cabbage. In addition to being packed with vitamin C and anthocyanin, red cabbage is packed with fiber, vitamin A, K, B6, potassium and manganese, and also contains vitamin B1, B2, folate, calcium, iron, and magnesium.